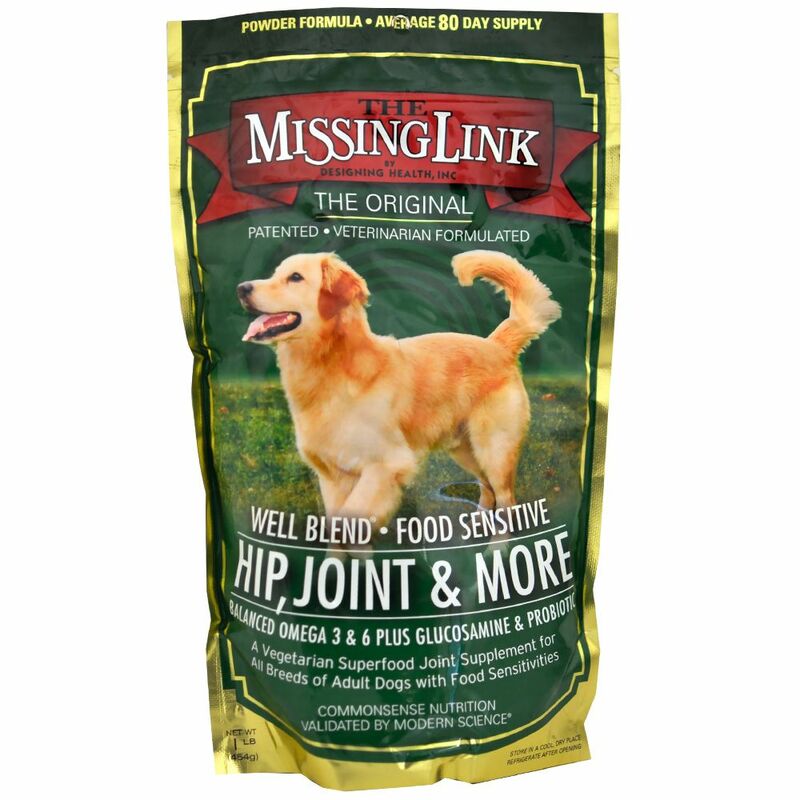 Missing Link Well Blend Hip & Joint is a palatable dietary supplement that promotes hip and joint health in dogs. This superfood supplement is ideal for all breeds of adult dogs and is formulated to be safe even for dogs with food sensitivities. The powder includes fatty acids, probiotics and antioxidants that work synergistically to reduce inflammation and rebuild components essential to healthy joint function. Missing Link Well Blend Hip & Joint is also free of preservatives, artificial colorings or flavors, and common allergens to ensure it is safe for all dogs. This resealable package contains one pound of the delectable supplement. Protect your pooch from arthritis and other degenerative joint diseases with a product they'll absolutely love and order today! Ingredients: Flaxseed, Glucosamine Hydrochloride, Rice Bran, Primary Dried Yeast, Cane Molasses, Sunflower Seed, Dehydrated Alfalfa Meal, Dried Carrot, Ground Barley Grass, Zinc Methionine Complex, Dried Kelp, Lecithin, Dried Lactobacillus Acidophilus Fermentation Product, Niacin (Vitamin B3), Pyridoxine Hydrochloride (Vitamin B6), Yucca Schidigera Extract, Garlic, Riboflavin (Vitamin B2), Thiamine Hydrochloride (Vitamin B1), Folic Acid, and Vitamin B12 Supplement. 50 lbs (avg. size) 2 tsp. 1 lbs. is approximately an 80-day supply for an average size dog. Feeding Instructions: Add the Missing Link® to your dog's diet according to its weight. Due to the high fiber content, start with small amounts and gradually increase to the recommended level over the course of a week or two.